I was talking and thinking about affordability of housing a couple of days ago and that same day saw a series of interactions on Twitter which included this one. I thought I’d play around with the mathematics of a simple example of housing. Let’s hypothesise that the average affordable one-bedroom home price should be a maximum of £150 per square foot of living space. Assuming an average, reasonably-sized one-bedroom home comprises 600 square feet of total living space, the price of this home would be £90,000. In 2009, the UK average weekly pay was £489 or around £25,000 per annum. Assuming a homeowner could save up enough for a 10% deposit and pay the stamp duty and transaction costs (conveyancing, survey), they would need a mortgage of at least £81,000. This loan represents 3.2x the average salary and assuming a total interest rate of 6%, a 25-year mortgage, the monthly payments would be one third of the homeowner’s net monthly salary. Based on prudent borrowing principles and affordability, this is just about manageable and housing costs should certainly not cost more than one third of someone’s net salary. The last time the price of an average flat was less than £90,000 was in August 2000. More recently, the average flat or maisonette (using data over the last 12 months) has been priced at £153,000 or £255 psf. House prices are increasing again since the low in March 2009 when the average cost was £141,000. The last time the average house price was at this level was March 2004. For those who are able to buy their homes, they continue to buy and house prices are on the rise again. In London it is even more accentuated with average salaries around £33,000 and average flat prices around £295,000 – that’s 9 times the average salary. And assuming a 600 square foot flat, a cost of £492 psf, more than 3 times the hypothesised affordable flat. So, what’s behind these house prices? The rule of thumb on residential developments is one third land cost, one third development cost, one third profit. If such a ratio were to be maintained, each of these elements must be reduced by a third which requires a complete re-basing of land values, materials, labour, and remuneration. Having spoken to architects about the average development cost, this ranges between £150 psf to £200 psf (not including professional fees and financing costs). The price of the hypothesised affordable house is in one way based on the development cost alone. To bring the price of buying a house back to affordable levels, one way which would have the greatest impact would be to remove the cost of the land and the profit element from the purchase price paid by a home-buyer. 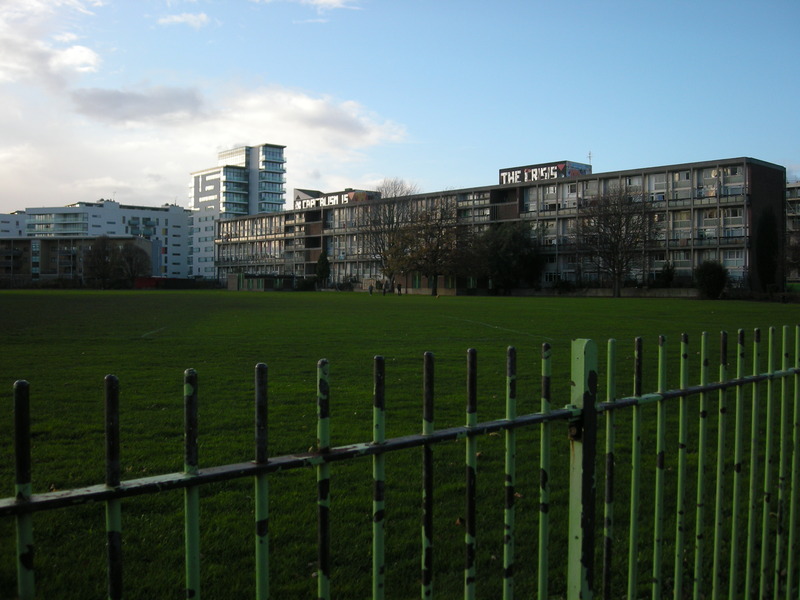 Community land trusts, housing elements of development trusts, co-operative housing, and other not-for-private-profit housing initiatives aim to achieve this. Land values are locked in, owned in perpetuity by a trust. Let’s stretch the imagination. Imagine a place where the price of all land did not increase over time. Where capital appreciation in the value of property came only from improving property or possibly changes in its use. Is this possible? What would the economics of such a place look like? A community land trust would fit right at home in such a place. I have been wondering how to provide affordable sustainable housing for some time now. The cost of housing can be broken down into the land or site cost, the build cost, and the developers’ profit. It is also influenced by the supply and demand for housing in a particular area as well as the cost and availability of mortgages. I thought about ways to control the land or site cost which typically required finding distressed sale situations or buying awkward sites at auction, which comes caveated with its own risks and uncertainties. I contemplated managing the development costs, subscribing to the adage of good design doesn’t have to be expensive. Interest rates are low at the moment, but a significant investment of equity is required and that doesn’t get a developer over the hurdle of managing risks and convincing lenders to part with their cash in a depressed property market. Besides, interest rates will not stay low forever and cannot be relied upon as a sustainable solution to affordable development. This led me to think about the factors affecting buyers that require housing to be affordable. A friend who was a teacher was able to purchase a one-bedroom flat four years ago with a significant government key-workers’ grant, based on certain criteria. 20% of the purchase cost of the flat was funded by this grant. My friend provided her own savings to pay for the stamp duty and legal costs and she was able to get a mortgage for the remaining 80% of the cost. From what I recall, if she ever sold her flat, she would have to repay the grant plus a proportion of the net profit from sale back to the government. It was on this basis that I was trying to develop a similar home-building concept, based on some form of profit-sharing if the properties were subsequently sold. The sale of a new, affordable property can be limited to a first-time or low-income buyer, but if the property was subsequently sold on the open market there is the inevitability that the property will no longer be affordable. Without the imposition of socially-minded restrictions, the provision of affordable housing is subject to abuse and manipulation, with profits lost in the open market rather than ploughed back into building more affordable properties. The transfer of land to the CLT is made at a fair and affordable price – this could mean existing use value, sub-market value, or the ultimate in affordability – £1. The long-term management, leadership, and governance of the CLT maintains the intentions and values of creating an affordable, sustainable community. Restrictions placed on the future selling prices of homes change the dynamics and economy of real estate on the site. Without these three features, sustainable affordability fails. At the sight of this, the capitalists might be throwing their hands up in the air. The attitudes that fuelled the property frenzy up to 2006/07 are challenged and confronted full-on. The easy money found in a rising property market is no longer. It was lazy and unproductive and, if anything, it was destructive. Many blame the banks for loose mortgage lending principles. But underlying it was an attitude that wealth could be created and accumulated through buying property and flipping it. Property was exchanging hands at lightning speeds, without any evidence of improvements – not in the businesses that it housed, not in the communities in which it was situated, not in the buildings themselves. Increases in capital value were speculative and not founded on true value creation or accretion. The whole ethos of a CLT challenges the attitude of relying on a rising property market for wealth accumulation. If a CLT and its development is managed properly and if a true sustainable community is built on and around it, it will be highly sought after – its value would sky-rocket. It’s a bit ironic because no one would actually be able to capitalise on that value other than qualifying to live there. Beautiful. Poetic even. Now that is the true value of property. For more information about Community Land Trusts, check out the entry on Wikipedia or the UK-based Community Land Trust Directory. London-based charity, London Citizens is bidding to develop the first CLT in London on the former hospital site of St. Clement’s. Read more about it here.